Smoothies make a great addition to any healthy diet. They are rich in vitamins, minerals, energizing sugars as well as protein depending on the ingredients used to make them. Blended fruit contains water as well, and thus can keep you hydrated. You can whoop up smoothies that are more nutritious by adding leafy green superfoods to your recipes. Despite their swamp-like appearance, green smoothies are delicious because the taste of fruits overwhelms that of raw, bitter vegetables. The best part is that your green smoothies will get a boost of phytonutrients, which are hard to come by in blended fruits only. There are dozens of leafy-green superfoods you can add to your smoothies. To help you get started, here are top 5 superfoods to add to your green smoothie recipes. You will also learn what they bring to the table in terms of nutrition. Kale is a nutrient dense leafy-green. One raw serving containing 100g by weight provides at least 3g of protein. It will also contain beta-carotene and more than a dozen other nutrients that support vital body functions. Kale is rich in vitamins A, C, and K as well as Folate. Rich in trace minerals such as manganese, copper, calcium, potassium, iron, magnesium, phosphorus, sodium and selenium, this leafy green superfood should definitely be making its way to your blender. If you like kale in your smoothies, you will also love spinach. Spinach matches the impressive nutritional profile of kale. However, it also contains a few unique nutrients, one of which is choline. This water-soluble vitamin helps support vital physiological processes such as brain development, liver function, muscle movement, nerve function and a healthy metabolism. Only coming second to quinoa, spinach has some of the highest levels of plant-based betaine, an important amino acid derivative that helps to synthesize neurotransmitters and melatonin. The next time you buy fresh beetroots from the farmer’s market, make sure not to throw away the tops. Packed with nutrients, beetroot leaves can increase the nutrient content in green smoothies. They are rich in vitamin A, C and K plus essential minerals like calcium, iron, copper, magnesium, calcium and manganese. Beet greens contain tryptophan, an amino acid that improves sleep patterns. Moreover, adding beet greens to smoothies is a great way to inject your diet with beneficial carotenoids and betalain pigments. Much like beet greens, chards contain betacyain pigments that cause the leaves to have reddish-purple veins. Scientists have found that many of the betalain pigments in chards have anti-inflammatory, antioxidant, and detoxification effects. Other studies show that chard leaves are rich in flavonoids that have cardioprotective and blood sugar regulating properties. Blending leaves from Swiss chards along with other fruits will also add a wide range of vitamins, trace minerals as well as fiber to your green smoothies. Collard greens are often consumed as steamed greens but adding them raw to your smoothies is the best way to extract their numerous nutrients, which become depleted when cooked. These cruciferous vegetables belong to the same family of plants as broccoli, cauliflower, cabbage and kale. As such, they are a rich source of vitamin A, C, and K. They provide your body with a good dose of fiber, trace elements, and antioxidants. Studies also show that cruciferous vegetables like collard greens have glucosinolates, sulfur-containing compounds linked with anti-cancer effects. With these top 5 superfoods for green smoothies, you can experiment with different fruit combinations to discover flavors that appeal to your taste buds. There are many other nutrient dense vegetables such as romaine lettuce, watercress, dandelion greens, bok choy, carrot tops and arugula, which would make great additions to green smoothies. Leafy green superfoods used in smoothie recipes can taste slightly bitter, earthy, peppery, or even go undetected when blended with sweet fruit. 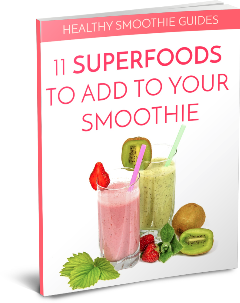 More importantly, using green superfood in smoothies is worth it since they provide many health-promoting phytonutrients that are not readily available from other food sources.